The paintings sense when someone is nearby and change from a still image to an animated one, complete with sound effects and often music and voices. 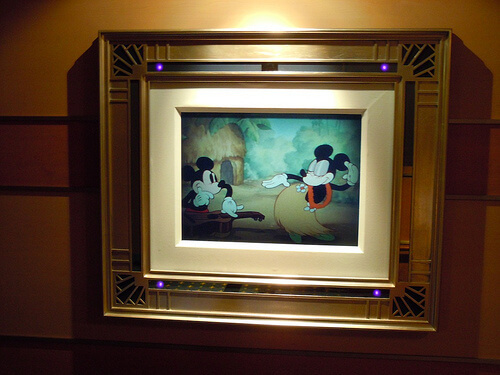 Disney’s enchanted art features familiar characters including those from Pirates of the Caribbean (the movies and the ride! ), Fantasia, and many short films. 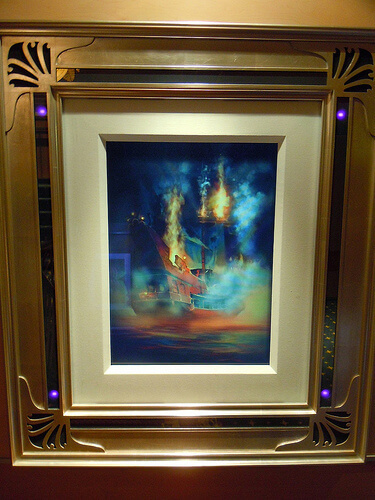 Some are scenes taken directly from the originals while others are new artwork designed specifically for the ship. 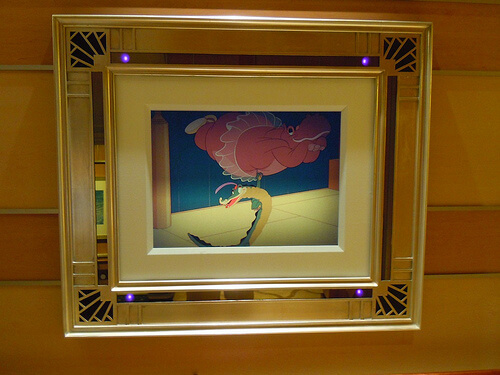 But not all artwork on the Disney Dream is the same. 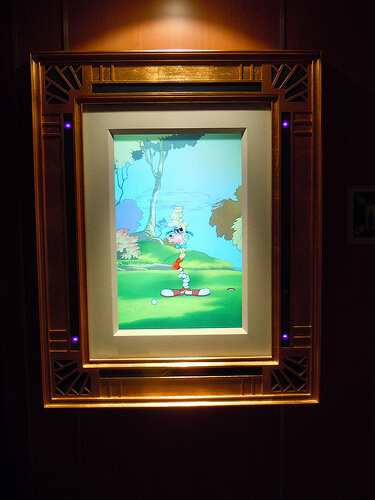 Disney’s designers have carefully placed enchanted pieces of art next to or nearby regular prints, so visitors never know which images will come to life. 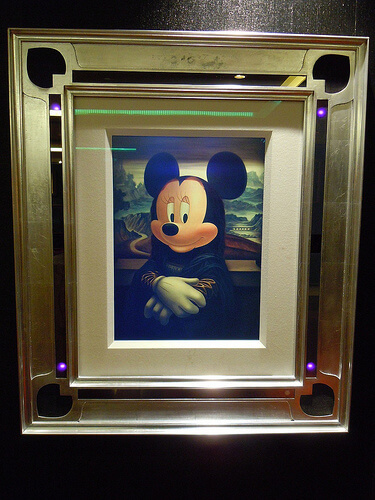 I’ll admit I was even fooled by a particular Mickey Mouse painting, which I thought for sure would animated when I approached it, only to find that it was just a regular painting. 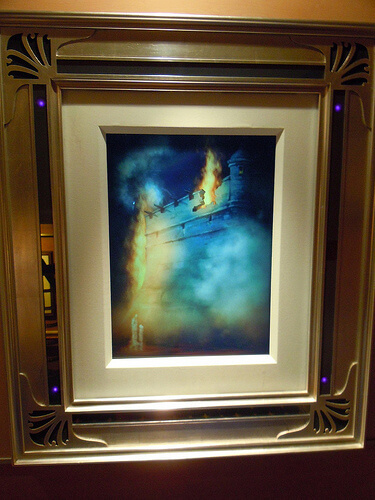 The enchanted artwork doesn’t glow like a regular computer screen or television, with covering coated in an anti-glare finish to enable it to blend in with other artwork. 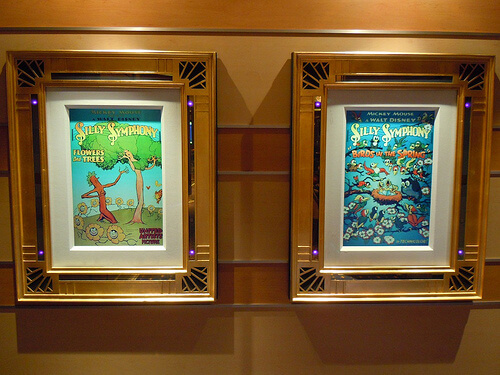 Each piece of enchanted art has several different animations, so guests aboard the ship will find themselves rediscovering the artwork throughout the voyage. 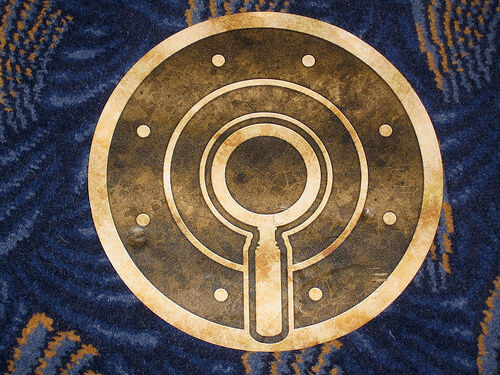 They’re located all over, near stairwells, in hallways, in open areas, and even tucked away. 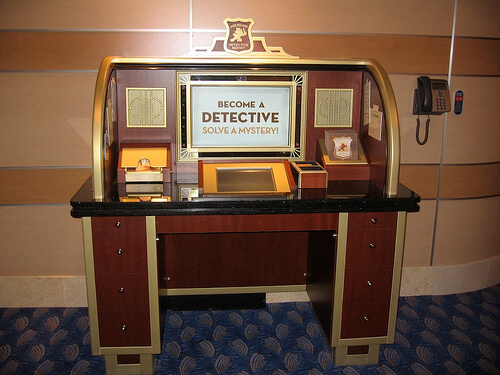 In addition, a special activity called the Midship Detective Agency enables guests to grab a “detective badge” of sorts that prompts special interactions and animations with some of the enchanted pieces of art, during which characters will pop out from the artwork with clues. Click here for all of our ongoing Disney Dream coverage, including hundreds of photos, videos, reports, and reviews! And keep returning as more will be added regularly.